Valve announced its "Second Annu-Hell Scream Fortress Hauntdead Halloween Special" complete with a new map, items for sale, and TF2's first boss. 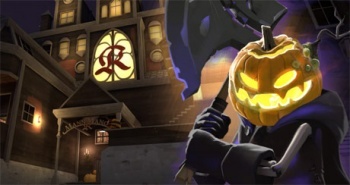 Last year, the TF2 team at Valve released a "Pumpkin Patch" that threatened to scare us dead. Keeping with the trend, this year's fantastically punny TF2 update adds even more goodies to its multiplayer shooter. On the new map, called Mann Manor, the game's first Boss can be killed by anyone and has the chance of dropping some phat lewts. The Horseless Headless Horsemann looks downright terrifying and killing him will earn you the "Sleepy Holl0WND" achievement. The TF2 update is available right now and is, of course, free of charge. The announcement is written in a comedic style reminisicent of a Simpson's Treehouse of Horror. Regarding the Horseless Headless Horsemann: "Where is his head? Where is his horse? Where are all the Draculas? We know the answer to one of those questions: They're still right behind you!" Valve asks us to enjoy its Halloween Special, if we dare. "Enjoy the update ... to the change of address form at the Post Office, because your new address is the cemetery because you've been buried alive! [sound of your parents paying for an expensive unnecessary funeral]"
The Horsemann is a long lost member of the Mann company. It's not clear which one but the TF2 website has a grave marked Silas Mann. When you click on the grave, you are brought to a family portrait torn asunder. What does all of this mean? That's up to you to find out, and then discuss ad nauseum on the forums.